Goodbye Clutter, Hello Freedom: How to Create Space for Danish Hygge and Lifestyle by cleaning up, Organizing and Decorating with Care is by Lena Bentson. It is a relatively short book, only 82 pages, but I would rather a book be the right length than too long or too short. (The right length is explaining what the author wishes to express, but not rambling.) This book is the perfect length. Less clutter will make your life happier, more organized, and more hygge-like. 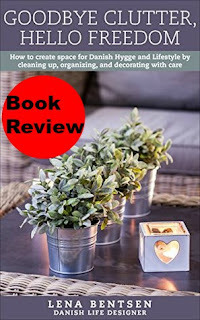 This book is a great way to get yourself motivated to start tackling some of those clutter drawers! I borrowed this book for free from Kindle Unlimited. You can read the beginning of it here. Thanks for sharing this review. I hadn't heard of this book yet. I read Joshua Becker's 'The More of Less' last year and it changed the way I see "stuff". I've probably gotten rid of at least 25% of our stuff and love it. That's fantastic! I'm listing stuff on eBay right now. I want to get rid of a lot of my items as well. :) This book motivated me, that's for certain!